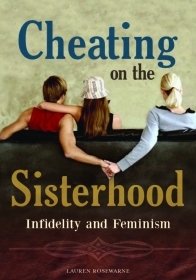 Cheating on the Sisterhood: Infidelity and Feminism is a feminist analysis of the imbroglio of sexual politics, brute sociobiology, and pop-mediated passion that is conjured up when a married man cheats on his wife with a younger, single woman. Drawing frankly on her own experience as the “other woman,” Lauren Rosewarne scrutinizes the alternate readings of the politics of cheating in terms of feminism’s program of gender equality. Arguing that contemporary feminism does not automatically endorse or reject any particular choices, she shows what happens when all three parties to the classic triangle happen to be feminists, each trotting out a different set of feminist arguments to justify, vilify, and rationalize his or her actions. Is the “other woman,” this book asks, just a tool of the cheating man’s assertion of gender dominance over both his mate and his mistress—and a willy-nilly traitor to the sisterhood?